By now, every person with a drivers license in the U.S. knows that all of the top automobile producers, and even Google, are positioning themselves to be the leader in the electric automobile sector. 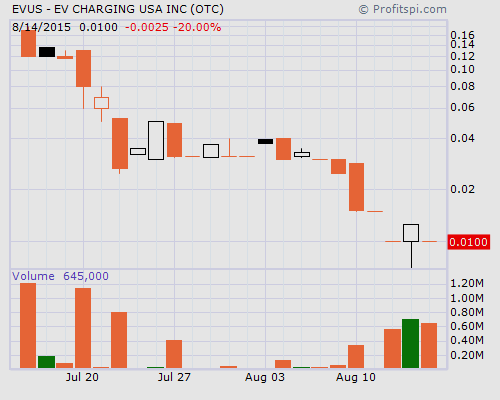 Hoping to tap into the charging portion of the industry, newly created EV Charging USA Inc. (OTC PINK: EVUS), is putting their foot down to get a piece of the action and some traders think it might be a wise decision. For those who know what’s behind the beginnings of EVUS stock, the evilness of formerly connected penny stocks may be warning enough as to why it should be avoided. EV Charging USA spawned from the remnants of Milwaukee Iron Arena Football, Inc. which Richard S. Astrom dully put forth a valiant effort in making itself presentable. With a long list of diluted tickers which stem back beyond the ironically named A Clean Slate Inc. (DRWN), ask traders who got duped into buying MSPC, ACOL or KGET shares before thinking EVUS stock is a good one to buy. The reason why EVUS even showed up on our screener was due to their inaugural PR last month which mentioned the likes of BMW, Chevrolet, Tesla, Nissan and Ford and their presence in the EV market being the reason why, after extensive research, deciding to launch an EV charging support related services division. Yes, the “Electric Vehicle Charging Services” is going to boom over the next 10 years when plug-in electric cars sold will reach 12 million and revenues from electric vehicle charging services will grow to $2.9 billion, but there’s a 99.999999999999% chance not a single penny of that money will ever flow into the hands of EV Charging USA. Even if the rare opportunity should arise that EV Charging was to get its ducks lined up and actually be a player in the EV Charging industry, in order to do such would require funding so that the charging stations could either be acquired, manufactured, or licensed. In order to do such a feat, hard, real dollars would be required or some form of share secured loans which, as one can see, is already in a SNAFU conundrum. Going into the SEC filings, there are already 5,060,155,892 shares of EVUS stock out of the 500,000,000 shares authorized issued and outstanding. This could simply be a misnomer on the filing since when the merger took place in October, 2014, Richard S. Astrom did relinquish his 5,000,000 Series A and 5,000,000 Series B Preferred shares in exchange for a $400,000 promissory note. They did file to have an additional 1,000,000,000 shares added to the authorized amount, but after the 2,530,000 Series D Preferred shares were converted into 5,060,000,000, the share structure is FUBAR in terms of matching up. In retrospect to the EVUS share structure, the prospectus filed in May does indicate that President and Sole Director, Brian C. Howe, does own 4,360,000,000 shares of EVUS stock which means only 700,155,892 are out there. Be that as it may, the business of providing electric vehicle charging services and charging stations, enabling EV drivers to recharge their vehicles easily at commercial locations or in their own garages is a cool story that smart traders simply won’t be buying into. Last updated by Timothy Richards at August 17, 2015 .